THE Christchurch mosque gunman has now been charged with 50 counts of murder, three weeks after the attack. Brenton Harrison Tarrant, 28, will appear in the High Court via video link tomorrow, formally charged with 50 counts of murder and 39 of attempted murder over the March 15 attack that killed 50 and injured 50 more. The Australian man first appeared in the District Court on March 16, charged only with a single count of murder following the massacre. In a statement on Thursday, New Zealand Police confirmed they have now laid 89 fresh charges against the accused. “Other charges are still under consideration,” NZ Police said. Tarrant, formally from Grafton in northern New South Wales, stands accused of shooting dead 50 worshippers and wounding dozens more at the Al Noor Mosque and the Linwood Islamic Centre in Christchurch. The accused terrorist is being held in New Zealand’s only maximum security prison in Paremoremo, Auckland. He has no access to television, radio, newspapers or visitors. The Federal budget certainly had a bit of good news for the Gold Coast, earning a ‘B’ grade from Mayor Tom Tate. The Gold Coast is set to benefit from a $112 million commitment towards the Light Rail 3A, though the Mayor says they should have matched the funding given to the second stage. “If they would increase the funding more to light rail 3A, to similar percentage to stage 2, they’d get more love from the Gold Coast. “I’d like to see another $40 million, added to the 112. “The state minister would probably want a bit more than that. “I’m just trying to go ‘what’s fair?’ – what you did for stage two,” Mayor Tate said. Another boost for the Gold Coast is an increase (to $30,000) to instant asset write-offs for small businesses to purchase equipment. “We have 65,000 small businesses on the Gold Coast, and I think that will aid the replenishment of capital outlay. “It’s attractive for businesses to spend the money there, and increase their productivity and get the tax right off,” Mayor Tate said. The Gold Coast will also benefit from the $30 million allocated for Roads to Recovery Black Spot funding, and an $8 million fast train study along the eastern seaboard. When it comes to M1 funding though, Mayor Tate says we should have received better and we need solutions now. “I remember the days when they said we need $22 million to do a business plan. “I said to them, get off your desk from Canberra, jump in your car, and drive from here, past Logan to Brisbane. “That’s your business plan – you don’t have to do a business plan. “Get on with the job and start engineering solutions. “Basically, the M1, everyone’s saying its a too hard basket,” Mayor Tate said. THE Queensland Government has slammed the federal government for failing to deliver big ticket items for the state in Tuesday night’s federal budget. Queensland walked away with $4 billion in new infrastructure spend for major road and transport projects, although only a quarter of that will be brought into forward estimates. Deputy Premier and Treasurer Jackie Trad said it put funding for critical infrastructure on the backburner, particularly the $5.4 billion Cross River Rail project. “The federal budget was fundamentally unfair for Queenslanders,” Ms Trad said. “There’s only one way to put it – Queensland is missing out. “There was zero funding for Cross River Rail which will get people home faster and deliver thousands of jobs across our rapidly growing region. “While the LNP continue to ignore Cross River Rail, they are spending billions on similar projects in Victoria and New South Wales. “Across the state, they say they’re spending $2.6 billion more on infrastructure but a massive $2.3 billion of that is more than four years down the track. “Queensland is growing and we need that investment now, not way out in the never-never. Ms Trad said it was also disappointing to see the state would lose out on $1.8 billion in GST revenue over the forward estimates. “There wasn’t a cent for critical programs like the National Partnership on Remote Indigenous Housing, which will disproportionately impact some of Queensland’s most disadvantaged communities,” she said. “There is also no allocation for the money owed to Queensland for services already provided in our TAFEs and hospitals. To help provide the basic essentials for women and girls in crisis, Share the Dignity and Retail First Shopping Centres are calling on Australians to donate tampons, pads and personal hygiene products during their April Dignity donation drive. Pink collection boxes have popped up at Australia Fair this month, with Gold Coast shoppers encouraged to help out local women and teenage girls in need by donating. Dignity founder Rochelle Courtenay said the organisation tries to alleviate the undignified situations that thousands of women across the country endure. “So many women every month have to forfeit sanitary products because they cannot afford them. Many mothers must choose between buying tampons and feeding their children. Girls miss out on school simply because families cannot afford to buy the basics of necessities,” stressed Ms Courtenay. “When they cannot have access to the essential feminine products, women become extremely resourceful…by using wadded up newspaper, or toilet paper, or socks. This should not be happening. Retail First Head of Marketing, Ms Bec Gascoigne said that Retail First Shopping Centres was excited to be part of the Share the Dignity drive again after a successful result in August last year. “Something as simple and inexpensive as a packet of tampons will make a great difference to a young Queensland woman in need,” Ms Gascoigne said. A NEW multi-million-dollar ski show jam-packed with spectacular stunts is set to wow the crowds at Sea World on the Gold Coast these Easter school holidays. The Village Roadshow theme park has partnered with Australia’s leading stunt crew, Showtime FMX to bring the Thunder Lake Stunt Show to life. 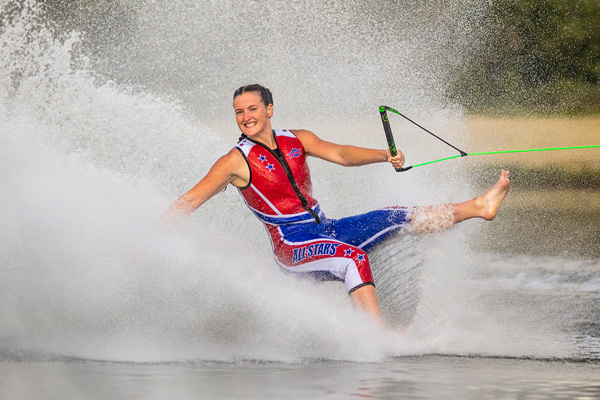 The new show includes some of the best water-ski, jet-ski and BMX performers in the country and will feature world-class stunts, action and comedy on Sea World’s iconic ski lake. Village Roadshow Theme Parks General Manager of Marketing Renee Soutar said the fast paced show will take guests on a wild ride. “The Thunder Lake Stunt Show centres around the Sun State All Stars and the Bay City River Rats with the two rival groups colliding in an epic showdown of extreme stunts and action,” Ms Soutar said. “We have worked closely with Showtime FMX on the production of this new show and have recruited some of Australia’s best stunt performers and designed custom-built vehicles such as the floating Truck which will be sure to have our guests in awe. Showtime FMX Director Gary Reid started his career in the stunt industry working in Sea World’s Ski Show in the 1990’s and said his team is excited to be bringing this show to life. “This is a dream come true for our athletes and we can’t wait to get out on the lake and perform some of the most insane stunts and action for Sea World guests,” Mr Reid said. Final rehearsals are underway for the show which will run twice daily from Monday, April 1. For more information, visit seaworld.com.au.